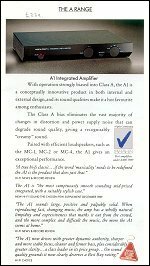 The A1 was a somewhat controversial amplifier from Musical Fidelity. The electronic design was by Tim de Paravincini. The amplifier was originally launched in 1984, and was in production until the early 90s. Today, it is considered a classic. The distinctive top cover is used as a heat sink and typically runs at 55-65°C - too hot to touch for more than a few seconds. This is caused by the output stage which is biased with a standing current of around 800mA. If one applies standard analysis, this results in the first 8 watts being delivered in class A - however, the designer argues that things are not quite that simple. It does have a certain sound that has earned it praise over the years, but whether or not this can be attributed to class-A operation is open to debate. It is undeniably coloured - some reviews draw comparison with valved equipment. Objectively, compared to its peers, the A1 has a generous power supply, uses some reasonable quality components and is quite well-made. Reliability is a thorny issue; there were no shortage of failures over the years. Facilities are minimal - you get an input selector and a volume control - apart from the power and tape-monitor switches, that's it. Well, apart from a phono stage that could do MC as well as MM. But no other facilities were included - no tone or balance controls, no headphone socket or loudspeaker switching and don't even think about remote control - this was 1984! Please note: The copyright of this manual belongs to Musical Fidelity, and while I believe that the inclusion here constitutes fair usage given the historical value, please be aware that it may be removed at any time. The A1 was released in 1984 to rave reviews. Minor revisions occurred throughout its life - early models didn't have ventilation holes in the side panels, and the top cover was in two sections. The power supply capacitors were "axial" (wire-ended) devices that laid flat across the PCB. There were also some component value changes over the the years. My 1990 example is regarded as a MKII. You can see the differences on the next page. Opposite is an extract from the 1990 brochure. The price is the sale-price that I paid - normal retail price at the time (summer 1991) was £300. Shortly after the MKII upgrade, the A1 was upgraded to Mark 3 status. This involved a minor power increase to 25 watts per channel. The reviewers largely raved about it. There were a number of special editions over the years. In 1991 Musical Fidelity released the "Collectors Edition" - of which only 24 were made, apparently. In the same year, they also released the "Final Edition", another limited production (only 200). Please note that these dates were taken from the Musical Fidelity booklet referred to above, and seem slightly earlier than my recollections - of course it takes time for stock to move via the retail channels. Both the Collectors Edition and the Final Edition had an external PSU, and the latter had an increased power output of 40 watts per channel. Amusingly, the Final Edition is actually a B200 - a completely different circuit with a MOS-FET output stage. Just about the only thing in common was the case! In parts of Europe, the A1 was called the A1-X. I've been sent some pictures of this, and I can't really tell any differences apart from the model designation. Also, there was a version in Germany called the "David". This was a tuned version, apparently. In 2008 the A1 was re-launched, but this new model resembles the original in style only - electrically it is completely different and it measures very differently. The user interface is also radically altered, with electronic control of volume and input source selection. And there is a USB DAC - that's a sign of the times! 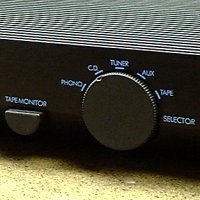 The front panel sports tactile push-buttons and an LCD alpha-numeric display module (Musical Fidelity use these a lot, but I feel that they are cheap and nasty on a premium product, given their limited contrast and very poor viewing angles). Of course, there is a remote control. A phono stage was provided, but MM only this time. Power output was quoted as 30 watts per channel.